Original and exciting, it is a novel about relationships, life, and the people involved in both. The characters are tangibly real; the plot is fascinating and will cause pages to turn rapidly. 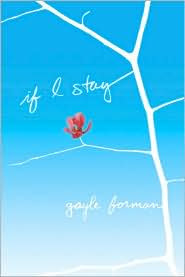 Teens and adults alike will find themselves falling in love with Forman's stunning novel. A sophisticated, layered, and heart achingly beautiful story about the power of family and friends, the choices we all make—and the ultimate choice Mia commands. Forman (Sisters in Sanity) expertly explores the teenager's life, her passion for classical music and her strong relationships with her family, friends and boyfriend, Adam. Mia's singular perspective (which will recall Alice Sebold's adult novel, The Lovely Bones) also allows for powerful portraits of her friends and family as they cope: "Please don't die. If you die, there's going to be one of those cheesy Princess Diana memorials at school," prays Mia's friend Kim. "I know you'd hate that kind of thing." Intensely moving, the novel will force readers to take stock of their lives and the people and things that make them worth living. I loved this book, it really isn’t just for teens.